The island of Formentera is rich in prehistoric remains, and one of the most important and well preserved is the megalithic sepulchre Ca Na Costa. This funeral monument, built between 1900 and 1600 BC, confirms the existence of a stable and organised township at the beginning of the Bronze Age, some 1000 years before the Phoenicians settled on Eivissa. The enclosure, of a great architectural quality, is formed by a sepulchre chamber, an access corridor and a complex exterior structure of concentric buttresses. It is to be found some five metres above sea level, near s'Estany Pudent, and can be accessed from the road from es Pujols to the port of la Savina. The monument is protected by an iron structure but can be visited from the outside at any time of the day. 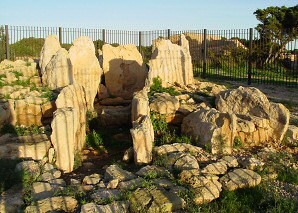 Other remains of the first half of the II millennium before Christ that can be visited on Formentera are the megalithic remains of Cap de Barbaria: the circle, the settlement and the cabins. These three megalithic settlements, known scientifically as Cap de Barbaria I, Cap de Barbaria II and Cap de Barbaria III are in a very ruinous state but even so offer valuable information about the first settlers of the island. They are easily accessed from the road that goes from Sant Francesc to the Cap de Barbaria. The Cova des Riuets, the megalithic wall of sa Cala and the Cova des Fum, all three to be found on la Mola, are also settlements of the same prehistoric era, but are difficult to access, particularly the caves that are in the cliffs of the Mola peninsular.